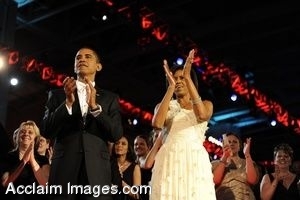 Description: Clip Art Photo of President Barack Obama and First Lady Michelle Obama and show their appreciation for the performers at the Neighborhood Ball in downtown Washington, D.C., Jan. 20, 2009. More than 5,000 men and women in uniform are providing military ceremonial support to the presidential inauguration, a tradition dating back to George Washington's 1789 inauguration. (DoD photos by Tech. Sgt. Suzanne Day, U.S. Air Force). Stock photography by Department of Defense Public Domain.